Wonderful experience, staff was very supportive & i found pretty good people staying out there. Thanks for nice experience. Nice laid back hostel with good lounge area to meet other travellers. Staff where all genuinely interested in helping you have the best time India. Special shout out to Raghu from their partner hostel who runs the food tour nearly everyday, would really recommend since going around old Delhi while eating top notch street food was a wonderful experience. Great location to explore Delhi. Fantastic value for a private room! Our stay at Backpackers Heaven@New King was exactly what we needed. Very very helpful staff that assisted us with booking tickets onward for our trip. Getting to the location of the hostel can be an adventure in itself, the busy market is a double edged sword since there is an amazing amount to see but many scammers as well. It's the price for being in a hostel-heavy area I suppose and once you learn not to engage, they're fairly inoffensive. I will recommend this hostel in the future. Really nice and helpful staff. We enjoyed our stay here and would definitely recommend it to others. If you're travelling to Asia for the first time this may hit you in the face. 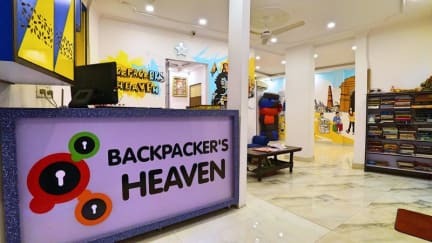 If you're a backpacker and familar with Asia, this place is fine for a short stay. Convenient walking distance to New Delhi station and Connaught Place. Rooms a little unclean and lacking of hot water. Fair value and really nice and helpful staff. A little tricky to find! Again welcome to India!! Bit boring but apart from that not bad. Staff were helpful. First thing to know, really really weird/creepy location in a middle of an alley of a busy bazar, not really easy to find. We had a private room so it was ok, AC and (sometime) hot shower. Not really a common place in the hostel so not really an atmosphere. But the owner was really nice with us and gave us recommendations for the rest of our trip. We also booked a food and heritage tour of the old Delhi (with Raghu), the experience was perfect!